It was a week or so into school, everything was so hectic, that we hardly saw each other together in the same room for more than 10 minutes at a stretch. So we decided that some family time was in order. It was the weekend when this show called the Extra-terrestrials had come to town at the Phoenix Mall. An mix of 11 or so international acts that featured some brilliant acrobatics, magic, laser shows, juggling, Cyr Wheel and uni-cycling. Anoushka had a her mouth wide open for a long while after the show and couldn't stop talking about it and frankly so did we. Whenever we go to Phoenix Mall, Anoushka has put in her attendance at the reverse bungee jumping for kids there. This time round it was a 45 minute wait, it being weekend and all, so while she was off making friends, Sudhakar and I actually found the time to settle down and chat. That done, it was time for dinner and some happiness for us - it was a toss-up between Chilies and Trader Vic, and we decided to give Hawaii a shot. First up, I honestly believed it to be a pub, loud and noisy (I would have headed right out if that were the case - but it turned out to be exactly the opposite. A few minutes after we were seated, the place was filled with families - spanning all ages. The place is dimly lit, black decor with spotlights for effect are predominant. Where possible, artifacts from the South Pacific were around - masks, spears et al were around. The seating is of all kinds, sofa, bar stool, sturdy chairs etc... Nice.. I would not have to worry about Anoushka being uncomfortable but I was concerned a bit about the several places where she wanted to hang from the railings and jump up and down the little steps. 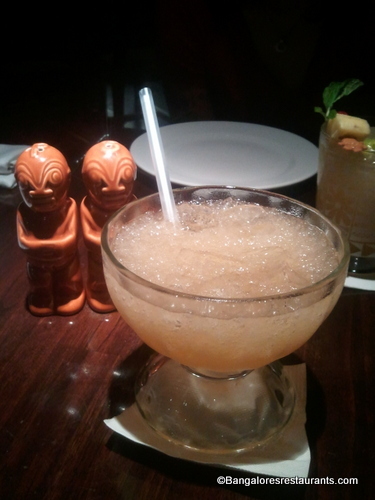 So it was time for mummy and daddy to be a little happy about the weekend and we ordered a Rusky Mai Tai and a Trader Vic's Passion Punch. 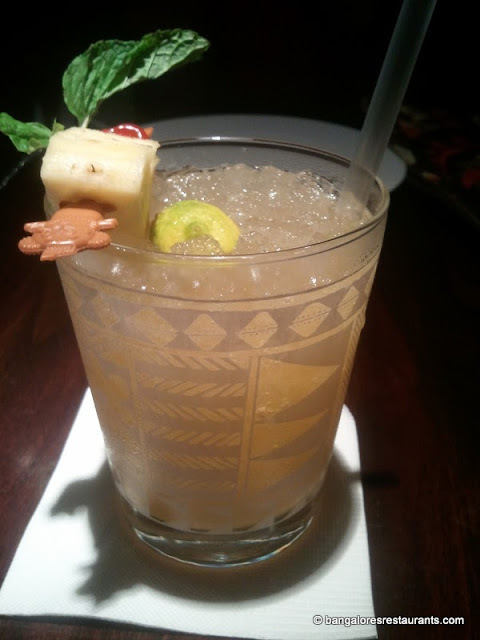 The Rusky Mai Tai was a take on the traditional version, with vodka in it. The vodka was a good one and was quite potent too, something that the crushed ice did not take away for the duration that the drink lasted me, which was the whole meal. Sudhakar's Trader Vic's Passion Punch too packed quite a punch - with the skewer of pineapple, cherry and mint, there was an added kick to this nice drink. For all the fuss that Anoushka throws, she is one child who loves her broccoli. 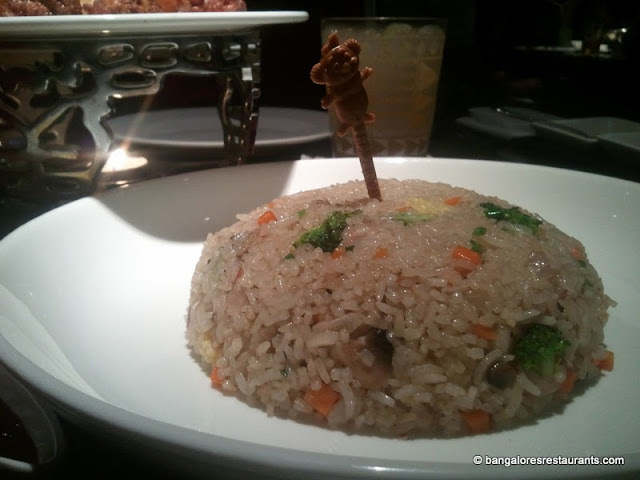 So when we saw that they had a vegetable fried rice with babycorn, beans and broccoli we asked them to customize a bit for us, get rid of the beans and put in more broccoli. This request was happily accepted and her food materialized first, which again made me a happy mummy. The rice was a nice one and considering that's all the little fuss pot was going to eat, I was glad that it was moist as well and not dry like it can sometimes get. She got through most of it. For us to nibble on we asked for the Island Tidbits that serves two. It comes served on a metal ornate platter with a little T-light that serves to be more decorative than it works on keeping the starters warm. Didn't need it to be warm though since we got through it at a good pace. 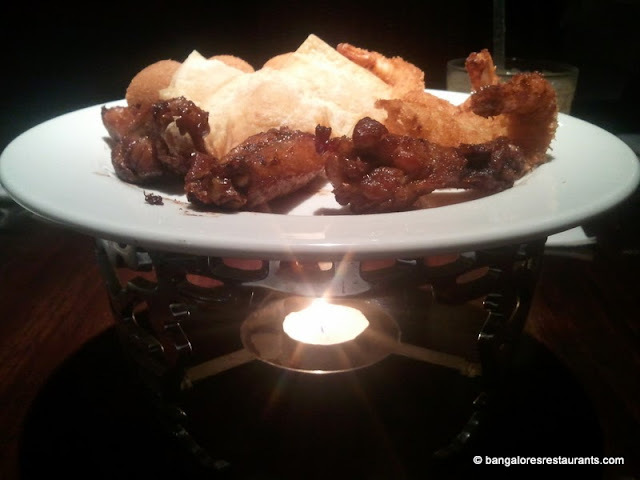 The platter comes with crispy prawns, rangoon crabs, cheese jalapeno balls and chicken wings. Stand outs in this were the cheese jalapeno balls, the prawns and the chicken wings. Nothing overdone, the spices and the marination just nice and they made a great pairing with the drinks. What I would have liked on the platter though would have been some garnishing in the form of fresh veggies - shredded carrot, cabbage and the like. While the menu is predominantly South east Asian with some interesting offerings, what really caught our eye was the dishes from the wood-fired oven. The meat I believe is suspended from hooks and cooked over a variety of woods that have been seasoned for the purpose. It sounded really nice. So from here we asked for the Wood Fired Trader Vic's burger and the Salmon Supreme. 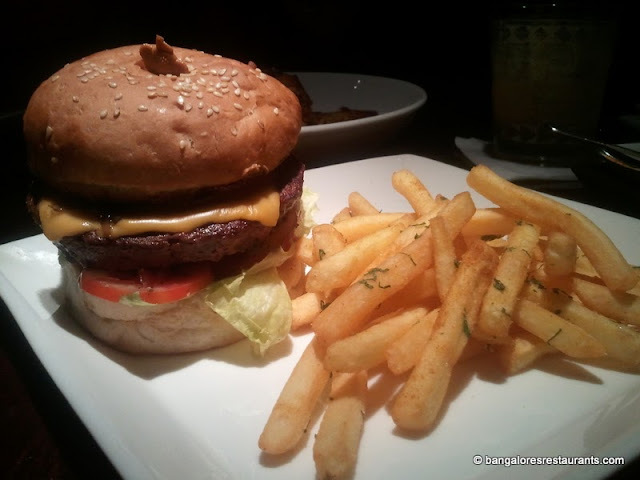 The burger patty was juicy, the bacon added that salty crunchiness and the whole thing came together rather well. It does seem a bit unwieldy when you look at it, but you can easily chow down on it without creating too much of a mess. 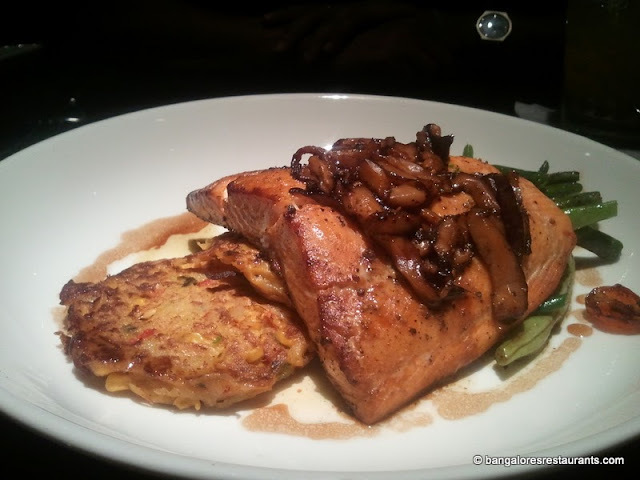 The Salmon Supreme came with caramelized onion, shittake mushrooms and a crispy corn potato cake. It was also doused in a bit of balsamic supreme sauce. The salmon portion was quite large at least for me. Its salmon and it was treated well, so there was no chance of it not tasting good. We had to wrap up with dessert and asked for the passionfruit cheesecake, which from first look itself I knew I was not going to like. And this was proved right in the first bite. 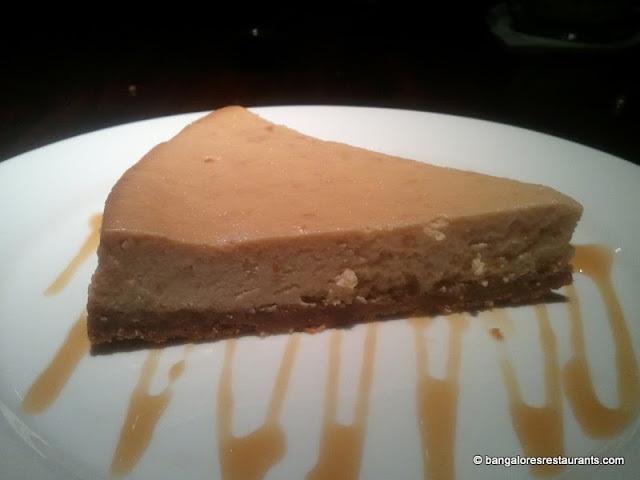 The passion fruit twang was missing and it felt more like a caramel custard on a biscuit base than a cheesecake. The only let down for the evening. The service was pretty good, with the staff being quite attentive and they knew their menu well. 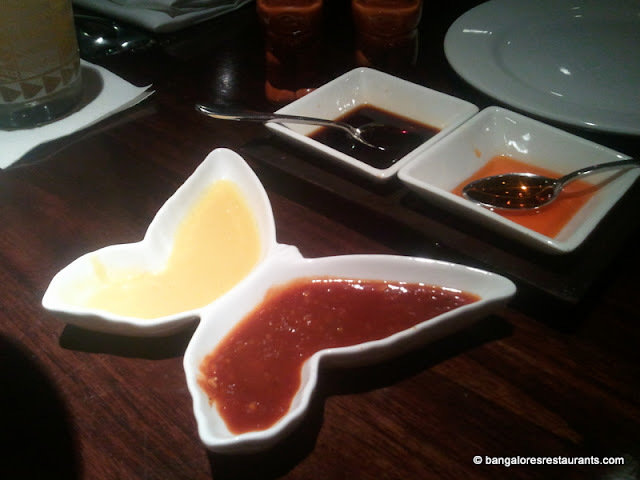 The meal came to Rs 3700 which is steep for the meal we had. I would liked there to be more attention to plating the dishes. The loo is clean.